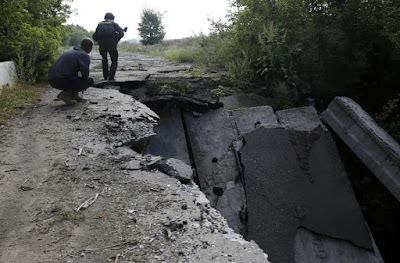 KIEV, Ukraine -- European monitors warned Friday that war-scarred eastern Ukraine faced a severe water shortage this winter because shelling had destroyed much of the industrial region's distribution pipelines. Ukrainian scouts patrol a neutral zone to survey the position of pro-Russian rebels in the Lugansk region on August 27, 2015. The former Soviet republic has been in the throes of a 17-month pro-Russian uprising that has killed nearly 8,000 people and stripped the area of reliable access to power and other basic supplies. A report prepared by the Organization for Security and Co-operation in Europe (OSCE) -- a Cold War body spearheading efforts to negotiate peace between Western-backed Kiev and the separatists -- said the lives of tens of thousands were at stake. "The current shortages in water in the conflict-affected areas of Donetsk and Luhansk regions could leave civilians bitterly cold throughout the coming winter as central heating systems break down and have lasting consequences on food production," an OSCE statement said. "The risk of the spread of water and sanitation related disease has increased as people are unable to store or transport sufficient water safely." It said the east's infrastructure was already in dire need of repair before hostilities broke out in the wake of pro-European protesters' ouster of a Moscow-backed president in February 2014. The OSCE said the problem affected both government-controlled towns and rebel-run districts along the loosely established demilitarisation zone that zigzags across the southeastern corner of Ukraine. Kiev cut off financial assistance to the insurgents nearly a year ago and insists that Russia -- officially recognised by Ukraine's parliament as an "aggressor" state -- take responsibility for repairing all damage. Russia portrays its western neighbour's conflict as a "civil war" in which it has played no part. It has also branded Kiev's financial blockade of the separatists a "war crime" that must be prosecuted in an international court. Fighting has subsided considerably since the foes signed off on another in a series of truce agreements on September 1. But the repercussions of Europe's bloodiest crisis since the Balkans wars of the 1990s continue to this day. The Ukrainian army said two of its soldiers were killed and five injured in separate mine blasts. The Donetsk insurgents said three civilians were also hospitalised after one of them accidentally set off a tripwire. The OSCE said locals' access to functioning wells was being hampered by land mines and "unexploded ordinances" across the disputed region -- an area the size of Wales that is home to estimated 3.5 million people. It also cited United Nations data estimating that 1.3 million people in the conflict region had already been "facing a serious water supply crisis" in July. A visiting UN envoy said after a 10-day tour to the region that he was "particularly concerned by allegations of indiscriminate shelling, and armed forces taking positions and placing artillery in civilian-populated area -- including at schools and hospitals." "There is however very little evidence that either the government or the armed groups investigate any of these allegations," UN special rapporteur Christof Heyns told reporters in Kiev.